I heard about MoonPies and their home in Chattanooga while at the SE GTG this year and decided to drive to the city to find out more. A moon pie or MoonPie is a confection, popular in parts of the United States, which consists of two round graham cracker cookies, with marshmallow filling in the center, dipped in a flavored coating. The snack is often associated with the cuisine of the American South where they are traditionally accompanied by an RC Cola. Today, MoonPies are made by the Chattanooga Bakery in Chattanooga, TN. The traditional pie is approximately four inches (100 mm) in diameter. A smaller version exists (mini MoonPie) that is approximately half the size, and a Double-Decker MoonPie of the traditional diameter features a third cookie and attendant layer of marshmallow. The four main flavors are chocolate, vanilla, strawberry, and banana. Double Decker MoonPies also come in lemon and orange; MoonPie Crunch comes only in peanut butter or mint. In 2014, a salted caramel flavor was introduced. 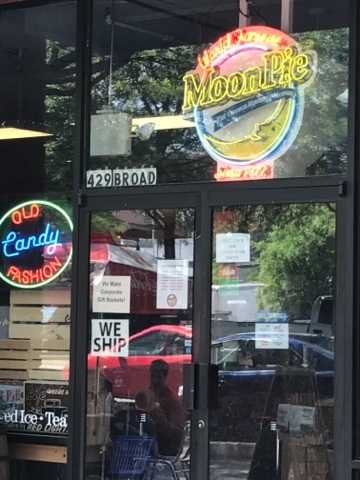 I went to the MoonPie General Store in downtown Chattanooga, pictures above. 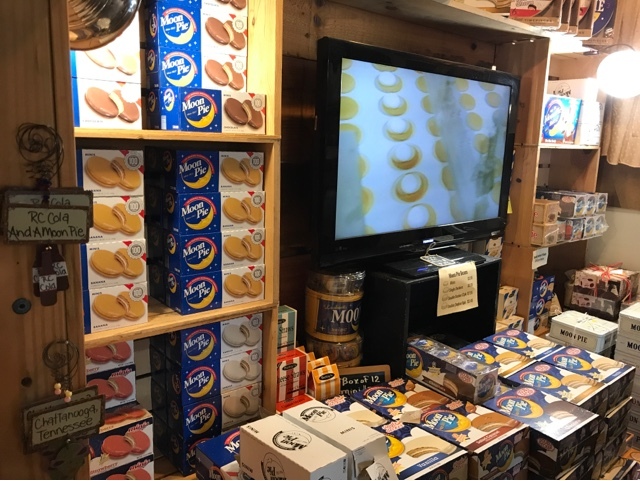 They had a video loop running providing information about the history of the MoonPie. There regular size MoonPies an small ones. Then they they have them in different flavors. 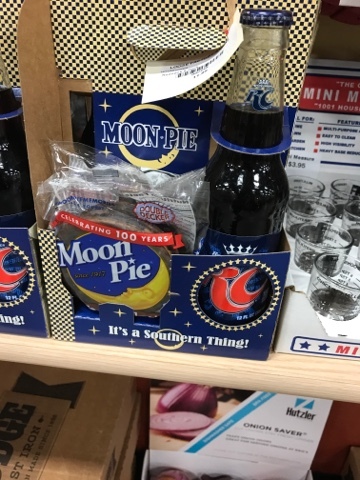 I also found out that MoonPies were paired with RC Cola as in the combination sold above. I drove to the factory across the river a few mikes away and found out from a sign that they do not give MoonPie Tours. I restrained myself from buying MoonPies as I have a rule not to keep sweets in the car as I travel as it is too easy to munch on them as I drive. Check out the moonpie webpage for additional information. I've been a fan of RC Cola since I was kid... Moonpies not so much. RC was not a New England thing and neither were MoonPies. Too much sugar for me now.